I’ve always tried to reserve my own usage of the word ‘extreme’ for cases that really warranted it. Perhaps that’s just a side effect of growing up in the ’80s, when everything that was anything was labeled ‘extreme.’ To that end, Full Fat’s Flick Golf Extreme [$2.99] is indeed an ‘extreme’ update to the original Flick Golf [99¢], but only in its locales, the gameplay hasn’t changed much. For the most part, the mechanics from Flick Golf remain intact in Extreme. You flick the ball off the tee, then you swipe to get it into the hole. You can swipe as much as you want to alter the direction mid-air, but you’ll only have the balls first three bounces to change course once it hits the ground. Your score is tallied by a series of different facets, but much like the first one, it’s more about stylized shots than accuracy. You can get a lot of points for whacking a ball straight into the hole, but you’ll get more by hitting it off-course and swiping like a crazy person to get it back on target. It’s a simple, enjoyable mechanic that didn’t need much in the way of refreshing for this release. Both World Tour and Quickshot make a return here, with World Tour acting like a campaign mode of sorts and Quickshot tasking you to rack up as many points as possible in a short amount of time. If you snag a bull’s-eye or a hole-in-one along the way, you’ll get time added. 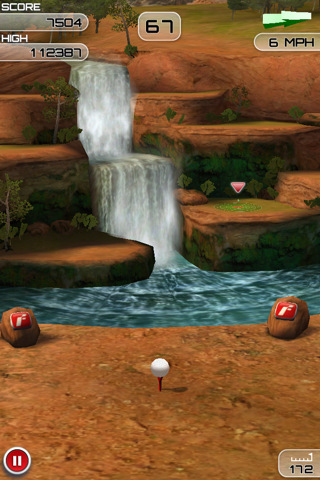 In addition to those is a Five Ball mode, where you get five balls as opposed to the campaign’s nine to get as many points as you can on each course, with a hole-in-one giving you an additional ball. If you get three hole-in-one’s in a row in any mode, your ball will light on fire á la NBA Jam, but I couldn’t for the life of me figure out what this actually changed, except perhaps as a score multiplier. Either way, it certainly adds to the extreme nature of the whole experience. The ‘extreme’ comes more in the way of location than it does in flaming balls. 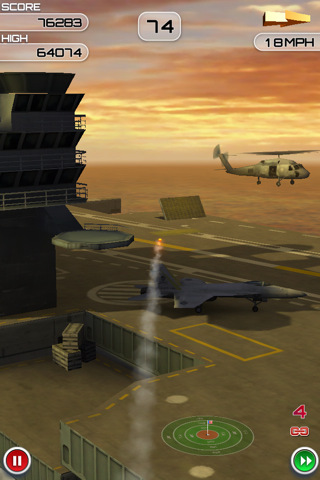 In lieu of playing on standard golf courses, you’ll be flicking balls off of helicopters, moving boats and from atop buildings across five different courses. Each course is unlocked by scoring a medal on the previous one and each has its own Game Center leaderboard attached to it. With the exception of the fifth and final course, you shouldn’t have too much trouble unlocking each of the courses. The last one tasks you with getting gold medals on the other four courses, which is a bit more challenging. There are also a whole slew of achievements for the Game Center lovers, but more importantly there is a full statistical breakdown of how you’re playing. Perhaps it’s just the statistics nerd in me, but I rather enjoy being able to play a game that keeps track of trivial facts like how long my ball has been in the air or my furthest drive. It adds a sense of progression on top of the unlocks and achievements that feels a bit more personal. Flick Golf Extreme looks as good as its predecessor, which is to say, it looks pretty good for a 3D golf game built for iOS. The ‘extreme’ settings are rendered well and for the most part, you won’t struggle too much to see what you’re aiming at. That said, Extreme has the same problem as Flick Golf did in that it’s a bit difficult to accurately judge distance and fall rate. It might have something to do with the lack of any real depth-of-field or shadows, but there are moments where you’ll likely start pulling the ball back mid-air only to realize you’ve fallen short of the target completely. As the title should suggest — Flick Golf Extreme is not a serious golf game, it’s a high score game with a golf wrapper. You don’t play through a nine or eighteen hole course, you simply hit nine balls off of a variety of different tees. It’s still as enjoyable as the first and considering the game already makes use of slightly weird physics and non-traditional gameplay, the ‘extreme’ version is a better representation of what Flick Golf is all about: a casual, leaderboard driven golf game.